Source: Produced in E. coli. 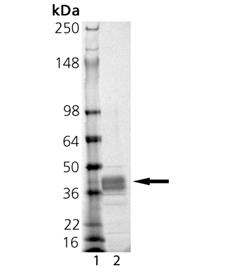 Active recombinant matrix metalloproteinase-9 (MMP-9, gelatinase B, 92 kDa type IV collagenase) cloned from human cDNA. The enzyme consists of residues Phe107-Pro449 (NM_004994), which comprises the catalytic/fibronectin domain of human MMP-9, with a C-terminal purification tag. This represents a naturally-occurring active form of MMP-9 which lacks the C-terminal hemopexin domain. Activity toward its targets, such as gelatin, casein, or peptide substrates, is unaffected. Formulation: Liquid. In 50mM TRIS, pH 7.5, containing 1mM calcium chloride, 300mM sodium chloride, 5μM zinc chloride, 0.1% Brij-35 and 15% glycerol. Activity: Preincubation of MMP-9 catalytic domain at 1.3nM with the broad-spectrum inhibitor GM6001 (Prod. No. BML-EI300) at 30nM for 1 hour inhibits enzymatic activity by 97%. Specific Activity: ≥20 U/µg. One U=100pmol/min at 37°C using the colorimetric thiopeptolide Ac-Pro-Leu-Gly-S-Leu-Leu-Gly-OEt (100µM; Prod. No. BML-P125) as substrate. Application Notes: Useful tool to study enzyme kinetics, cleave target substrates, and screen for inhibitors. Handling: Avoid freeze/thaw cycles. After opening, prepare aliquots and store at -80°C. Scientific Background: Matrix metallopeptidase 9 (MMP-9) belongs to a class of enzymes that belong to the zinc-metalloproteinase family involved in the breakdown of extracellular matrix in normal physiological processes, such as embryonic development, reproduction, angiogenesis, bone development, wound healing, cell migration, learning and memory. Its also associated with numerous pathological processes, including cancer, immunologic and cardiovascular diseases. SDS-PAGE Analysis: Lane 1: MW Marker, Lane 2: 1μg MMP-9 (catalytic domain) (human), (recombinant, E. coli).